Although we weren't big fans of the original Acer Aspire Switch 10 E, we're looking forward to the new Special Edition version. Acer just unveiled an updated model of the 10.1-inch hybrid that features Windows 10 and a Corning Gorilla Glass screen. This new screen material, which is near-ubiquitous on today's smartphones, is ideal for rugged environments and classrooms, where drops, scrapes and bumps are common. The enhanced screen won't change the fact that this device doesn't deliver much power (thanks to its Intel Atom processor) or that its battery will die in less than six hours as a laptop and eight hours as a tablet. The hybrid's specs are mostly unchanged. You'll get 2GB of RAM and 64GB of flash storage (with 500GB extra when connected to the keyboard). The display is still an underwhelming 1280x800 resolution, although thanks to Corning it might not suffer from the same awful screen glare as the previous model. Thankfully, the new Gorilla Glass screen won't change the hybrid's portability, which is one of its key features. As a laptop, the Switch weighs only 2.6 pounds, and as a tablet its weight gets cut in half. 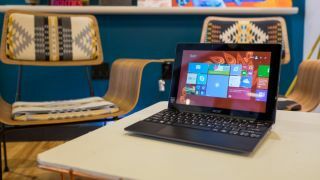 If you're looking for something similar, but you don't necessarily want this hybrid, you can always turn to the Asus Transformer Book T100 Chi and the Dell Venue 11 Pro 7000. Both hybrids performed better than the Switch Special Edition's predecessor. However, the Dell and Asus tablets will run you almost double the Switch 10 Special Edition, which will retail for $349 (about £285, AU$800) when it becomes available. We've reached out to Acer for an exact date. We'll get back to you when we receive a response. Who makes the Best Hybrid Laptop?